The first rib is the most superior of the twelve ribs. It is an atypical rib and is an important anatomical landmark. It is one of the borders of the superior thoracic aperture. The ribs form the main structure of the thoracic cage that protects the thoracic organs. There are 12 pairs of ribs which are separated by intercostal spaces. The first seven ribs progressively increase in length, the lower five ribs then begin to decrease in length. Ribs are highly vascular and trabecular with a thin outer layer of compact bone. 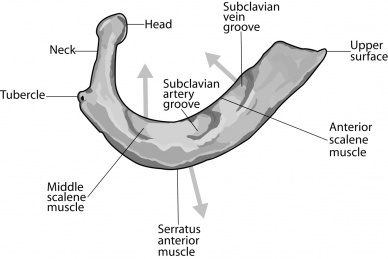 Similar to the first rib, the 11th and 12th ribs are considered atypical ribs due to their anatomical features. The remaining ribs are typical. Arterial blood supply arises from the internal thoracic and superior intercostal arteries. The internal thoracic artery supplies the anterior body wall and its associated structures from the clavicles to the umbilicus. It originates from the first part of the subclavian artery in the base of the neck. The superior intercostal arteries are formed as a direct result of the embryological development of the intersegmental arteries. These arteries are paired structures of the upper thorax which normally form to provide blood flow to the first and second intercostal arteries. Venous drainage is to the intercostal veins. The first rib is innervated by the first intercostal nerve. The intercostal nerves are part of the somatic nervous system, and arise from the anterior rami of the thoracic spinal nerves from T1 to T11. The intercostal nerves are distributed chiefly to the thoracic pleura and abdominal peritoneum and differ from the anterior rami of the other spinal nerves in that each pursues an independent course without plexus formation. The first intercostal nerve is joined to the brachial plexus through a branch, which is equivalent to the lateral cutaneous branches of remaining intercostal nerves. Another exception with the first intercostal nerve is that there is no anterior cutaneous branch. It is also very small as compared to the remaining nerves. The first rib, in particular is involved in thoracic outlet syndrome and Pancoast tumour. The term ‘thoracic outlet syndrome’ describes compression of the neurovascular structures as they exit through the thoracic outlet (cervicothoracobrachial region). The thoracic outlet is marked by the anterior scalene muscle anteriorly, the middle scalene posteriorly, and the first rib inferiorly. The term ‘TOS’ does not specify the structure being compressed. TOS affects approximately 8% of the population and is 3-4 times as frequent In woman as in men between the age of 20 and 50 years. Females have less-developed muscles, a greater tendency for drooping shoulders owing to additional breast tissue, a narrowed thoracic outlet and an anatomical lower sternum, these factors change the angle between the scalene muscles and consequently cause a higher prevalence in women. Signs and symptoms of thoracic outlet syndrome vary from patient to patient due to the location of nerve and/or vessel involvement. Symptoms range from mild pain and sensory changes to limb threatening complications in severe cases. Or otherwise known as superior sulcus tumour, refers to a relatively uncommon situation where a primary bronchogenic carcinoma arises in the lung apex at the superior pulmonary sulcus and invades the surrounding soft tissues. Although classically superior sulcus tumours present with Pancoast syndrome, this is only the case in approximately 25% of cases. The missing element is usually Horner syndrome. The most common symptoms at presentation are chest and/or shoulder pain, with arm pain being also common. Weight loss is frequently present. ↑ Marhold F, Izay B, Zacherl J, Tschabitscher M, Neumayer C. Thoracoscopic and anatomic landmarks of Kuntz's nerve: implications for sympathetic surgery. Ann Thorac Surg. 2008;86:1653Y1658. ↑ 10.0 10.1 Thoracic Outlet Syndrome. (2017, December 15). Physiopedia, . Retrieved 14:29, January 21, 2018 from https://www.physio-pedia.com/index.php?title=Thoracic_Outlet_Syndrome&oldid=181267. ↑ Webb WR, Higgins CB. Thoracic imaging, pulmonary and cardiovascular radiology. Lippincott Williams & Wilkins. (2005) ISBN:078174119X. ↑ Alifano M, D'aiuto M, Magdeleinat P et-al. Surgical treatment of superior sulcus tumors: results and prognostic factors. Chest. 2003;124 (3): 996-1003.